Even in the current tough economic climate, Ford seems to be moving from strength to strength, and also being able to innovate along the way. The most recent evidence of all this is in the news that various versions of the company’s new for 2011 pickups will be able to run up to 20% bio-diesel or as flex fuel rides. Recently, Ford announced the alternative fuel capacity of vehicles in their 2011 F-series lineup, which is constantly either the best selling, or second best selling vehicles sold in the U.S. Ford is not only adding a new E85 capable engine, but they will also will offer a diesel engine that is compatible with a B20 biodiesel blend right from the factory. Until now, many diesel car manufacturers have been hesitant to say the least about letting any bio-d into their tanks. Lots and lots of warranty concerns, and some refiners and bio-diesel providers have been rumored refusing to pump the French fry juice into new VWs and Mercedes. Looks like Ford won’t be sharing similar concerns … or at least they won’t by the time the 2011 F-Series hit the showrooms. 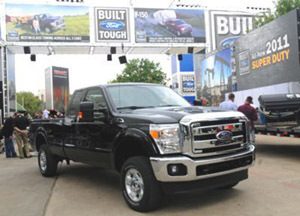 The upcoming 2011 F-Series Super Duty line will feature an all-new set of available powertrains. Most notable in the new range is the in-house designed, engineered and built 6.7-liter Power Stroke V-8 turbocharged diesel engine. Designed to be the workhorse engine for the workhorse ride in the FoMoCo inventory, this will be the mill that will help to deliver everything from building materials to packages. The all-new Power Stroke will also deliver significantly improved torque and horsepower and class-leading fuel economy as well as featuring biodiesel compatibility up to B20. Ford will also roll out in 2011 another all new plant when the new 6.2-liter V-8 gasoline engine is added to the lineup. The 8-cylinder mill also delivers appreciably enhanced torque and horsepower as well as offering class-leading fuel economy. On top of that the new gas engine can run on regular-grade gasoline, E85 or any blend in between. Hybrids Too Quiet For Japan?